Welcome to Today@WKU, the daily newsletter from WKU Public Affairs, for February 26, 2019. Check out the latest WKU Week in Photos. WKU gallery show highlights Ali with images from Courier Journal photojournalists: More than a dozen staff photographers for the Courier Journal documented Muhammad Ali’s rise to fame and his later years fighting a different fight, Parkinson’s Disease. On March 11, WKU and the School of Journalism & Broadcasting will open a tribute to the photographs and photographers of Muhammad Ali. Picture: Muhammad Ali, a hard cover book, will be celebrated in a 50-photo exhibit at Jody Richards Hall Gallery. Sisters establish scholarship to honor parents: Dr. Wanda Weidemann and her sister, Joyce Weidemann Young, established a scholarship to honor their mother and father who were unable to go to college but made sure their children were able to pursue higher education. Spotlight: Dance Big Red: Last year, Dance Big Red raised more than $70,000 for Norton's Children's Hospital. This year, the goal is even bigger! All WKU friends and family can support the March 29 event with a donation, and students can still register to participate. Learn more at www.dancebigred.com. WKU Week in Photos: Check out the latest WKU Week in Photos. Winter Super Saturdays: Check out photos from Week 4 of Winter Super Saturdays, hosted by The Center for Gifted Studies. Herald to host first WKU Housing Fair today: Finding the right place to live is among the confusing choices college students face each year. The College Heights Herald will bring WKU students a new level of access to the best information today during the first WKU Housing Fair from 11 a.m. to 3 p.m. at the Downing Student Union. Board of Regents to conduct quarterly meeting March 1: The WKU Board of Regents will conduct its quarterly meeting on Friday (March 1), beginning at 8:30 a.m. CT in the Martin Regents Room of Jody Richards Hall. Football: Hilltopper Spring Practices Open to the Public; Set to Start March 12: WKU will hit the practice field for the first time under new head coach Tyson Helton on March 12, the first of 15 practices during spring football, and all practices will be open to the public. Softball: Hilltoppers Blast Four Homeruns & Nunn Shines in Sweep: WKU Softball picked up where it left off Sunday night at the plate, combining for 17 runs on 21 hits to complete its sweep of the Hilltopper Classic. The Red and White opened the day with a walk-off run-rule victory over Cleveland State in six innings behind Shelby Nunn's one hitter before holding on for a 9-7 win against Indiana State to seal the sweep. Next: WKU (10-2) will head to Birmingham, Ala., for four games at the Samford-hosted tournament beginning Friday. Baseball: Sims, Sanford Each Smack Two Hits in EIU Series Finale: Middle-of-the-order hitters Davis Sims and Jake Sanford combined to go 4-for-8 as WKU Baseball lost by a score of 8-1 to visiting Eastern Illinois in the series finale against the Panthers on Monday afternoon at Nick Denes Field. Next: WKU (5-2) vs. Murray State at 3 p.m. Wednesday. Men’s golf: Tops Push Up Leaderboard in Improved Second Round at Auburn: Every competitor for WKU Hilltopper Golf matched or improved on their first-round score Monday at Auburn's Tiger Invitational, as the Hilltoppers moved up four spots to 10th in the team standings heading into the final day. WKU shot 14 strokes better in the second round at the par-72, 7,289-yard Grand National on the Lake Course, carding a 4-over 292 on Monday. Trailblazers Program honors six: A bank officer, WKU’s top law enforcement official and the head of maintenance and engineering at The Medical Center were among those honored Sunday by the Bowling Green Trailblazers Organizing Committee for their professional excellence and pioneering work. 11 a.m.: WKU Housing Fair. Downing Student Union. Contact Chuck Clark, (270) 745-4206. 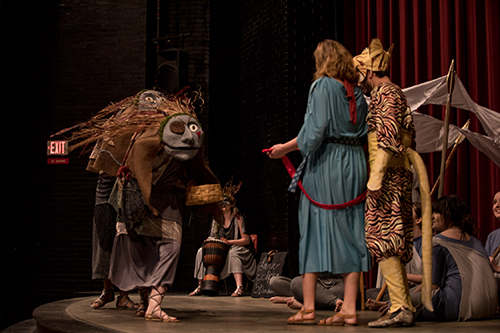 8 p.m.: Theatre Production: Aglaonike’s Tiger. Gordon Wilson Hall Lab Theatre. Admission is $16; $12 for students and seniors. Contact Theatre and Dance, (270) 745-5845.